Burns-Katsidis: Can Michael make it a hat-trick in the UK? By Peter Wells: It was a warm September night in Glasgow when an unlikely challenger stepped into the ring completely against the odds. Fans cheered in hope rather than expectation, and did all they possibly could to motivate their home fighter and put off the unbeaten world champion. Before the fans had even seated themselves the experts where sitting with a told-you-so look on their faces as the Scotsman hit the canvas from the first notable punch of the fight. As the fight wore on that expression slowly changed to one of shock and confusion as Ricky Burns held the WBO Super Featherweight title aloft in one of the upsets of the year. Roman Martinez stood as shocked as the rest of us. Since then Burns has failed to follow on in such exciting fashion managing wins over 3 fringe contenders, Andreas Evenson (W PTS), Joseph Laryea (W RTD 7) and Nicky Cook (W TKO 1). Then after talk of a fight with number 1 contender Adrien Broner it was announced that Ricky Burns would move up to Lightweight after struggling to get down to the Super Featherweight limit. It is very understandable as at 5’10”, Ricky is a very big Super Featherweight and did fight at Light Welterweight as an amateur. Despite criticism he hasn’t took on a light touch for his first fight at Lightweight in rough and ready Australian Michael Katsidis. The WBO Interim champion may be showing signs of a decline, but we’ve said this before. After two defeats on the bounce to Joel Casamayor (L TKO 10) and Juan Diaz (L PTS) he came back to win four on the trot and none more significant that Kevin Mitchell whom he knocked out in just 3 rounds in Kevin’s backyard. Unfortunately he was struck by the same fate again being knocked out in 9 by Juan Manuel Marquez after the tragic death of his brother and then a points defeat to Robert Guerrero. Since then he knocked out limited challenger Michael Lozada (W KO 3). The likeable Aussie is now hoping to make it a hat-trick of victories on the British shores, but this may well be a harder task than his other two. Both of those British fighters failed to make the half-way mark but one believes that Burns will be able to execute a game plan much the same as what Robert Guerrero did, by boxing smartly and avoiding any lapses in concentration. Katsidis will keep coming but i can’t see him finding Ricky’s chin on enough occasions to turn the fight in his favour. 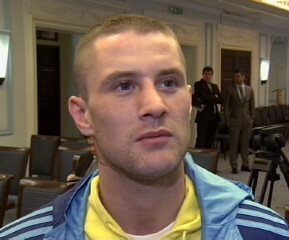 So the pick is for Ricky Burns to box his way to a win on the cards. After, Burns has plenty of mouth watering clashes on offer, including fellow Brit, Kevin Mitchell or the winner of the Brandon Rios-John Murray clash. Katsidis has the reputation to earn himself another payday against a top fighter, and I’m sure clashes with Humberto Soto or Brandon Rios would make for something special. Boxing » Michael Katsidis » Burns-Katsidis: Can Michael make it a hat-trick in the UK?